Alessandro Alberici joined the Part-Time MBA program in 2014 at MIP Politecnico di Milano Graduate School of Business, where he had the opportunity to attend many networking and companies’ events. After attending the EU Operations Pathways program presentation event organized by the Career Office of MIP, he went through the online selection and finally succeeded the on-campus 1-day panel interviews done by Amazon at MIP. 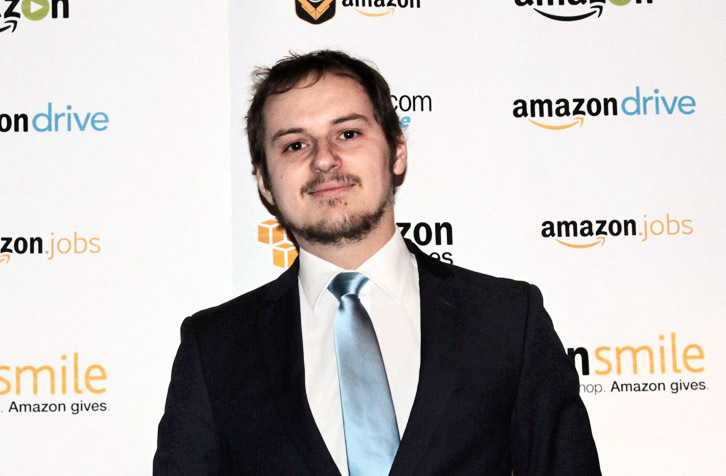 After the graduation in summer 2016, Alessandro moved back to France while joining Amazon as Pathways Operation Manager. What is your role at Amazon and what is your professional background? I am a Pathways Operations Manager, currently acting as an Area Manager at Montelimar, France. After a double degree in Mechanical/Industrial Engineering at Politecnico di Milano and ENSTA-ParisTech, I studied for a Master’s degree in International Economics at Sorbonne-Paris 1. After completing an EDF graduation project at Accenture, France, I went back to Italy to work at ABB as Global Product Manager for Low Voltage devices. After four years, I moved to Vodafone as Senior Product Manager for B2B software solutions, working with partners such as Microsoft and Google. While working at ABB and then Vodafone, I took an MBA at MIP – Politecnico di Milano Graduate School of Business. After graduating I was recruited for the Pathways programme and moved back to France. What do you like best about working at Amazon? One of the Amazon mantras for recruiting new people is to ‘raise the bar’, and this core value is very evident! Everyone around you is bright, extremely talented and engaged in the continuous improvement and success of the company. The workplace is dynamic and challenging: you can see the immediate results of your actions and contributions. Ownership is a reality at Amazon, just as diversity is a true value. What is the Amazon Pathways programme and what makes it unique? In my opinion, the Amazon Pathways programme is one of the best MBA graduate programmes available. It is a well-defined three year programme that serves as fast track to senior leadership. It represents a great opportunity to lead big teams in one of the most international organisations in the world. Another strength of the Pathways Programme is that you start small: your time spent at the Amazon Associate Week and tenure as Area Manager are invaluable experiences you will carry with you in your career. As a senior leader at Amazon, you will make strategic decisions that impact upon the lives of thousands of people. Why did you decide to join the Pathways programme? I was looking for a position in operations that focused on products and service business logistics, within a growing, multinational company with a strong European presence. There is no better company than Amazon to meet my requirements. More specifically, the Pathways programme provides the opportunity to work in operations, right at the heart of Amazon, and develop you into a senior Amazon leader within a short timeframe. What does a typical day for a Pathways manager look like? As a Pathways manager you are assigned to a shift, which means that you have a very large team to manage, and together you fulfill orders, while delivering the best possible customer experience. You also work on capacity and planning in deep cooperation with the Operations Managers. Keywords for a Pathways manager’s day are: safety, quality, customer experience, capacity and productivity. Amazon corporate values are the leadership principles. What are the two leadership principles essential to the Pathways programme? Leadership principles are part of everyday life here at Amazon. The two that I find most essential are, ‘Learn and Be Curious’ and ‘Deliver Results’. To learn and be curious expresses the essence of every Amazonian’s first months with the company: you must absorb the huge quantity of notions, systems, tools and guidelines that make the magic work. So this principle is very appropriate for guiding you through this time. Valuable knowledge is everywhere in the company, you just have to adopt a proactive, curious approach to gain the nuggets of wisdom you need. In addition, ‘Deliver Results’ is key for every Amazon employee, but it is even more relevant for a Pathways manager. You are expected to go fast, understand the business and contribute to it, while delivering data-driven results. How do the skills and knowledge acquired during your MIP years support you in your Pathways manager job? Both soft and hard skills are important to succeed as a Pathways manager. The hard skills may vary from core operations competencies, such as transportation, supply chain, capacity planning and execution planning, to advanced enterprise software capabilities. Marketing and sales competencies also help you gain a more complete view of the overall picture, when talking to retail colleagues. Given the large scale of the teams you have to manage, soft skills are also very relevant, from communication, team building and management, to decision making and crisis management. All the knowledge acquired thanks to curricula courses, seminars and professional presentations, gave me a very wide spectrum of competencies. What kind of mentorship does Amazon provide to support your success in the Pathways programme? As Pathways manager you are able to meet top senior managers who follow your progress closely, with regular one-to-one meetings. The level and quality of support they provide for your development is amazing, they meaningfully contribute to your successful growth in the role. Moreover, as any other Amazon operations manager, you are offered a series of learning opportunity weeks, both at the European headquarters and in the Fulfillment Centers. Finally, a vast catalogue of online training sessions are offered, and they enable you to deep dive and fully investigate a specific subject. What is the biggest challenge you experienced during your first months at Amazon? It was 6:00 AM one Saturday morning at my Fulfillment Center. I quickly came to understand the unique set of challenges ahead of myself and my team for that day. At that time, I was the only manager in the Fulfillment Center, with senior management available on-call if needed. Right after our start of shift team meeting, one of the pack lines suddenly stopped working. The maintenance team reacted as quickly as they could, but the issue was a serious one: more than six hours would be required to address the technological difficulty, and the pack line would be out of action for this entire time. Consequently, this would mean one of the operations teams would be not be able to perform their jobs at all. It was up to me to react rapidly and take all elements of the situation into consideration. I performed relevant data analysis, developed a response plan, adjusted capacity, escalated issues to both management and cross-functional colleagues. Ultimately, together with my close-knit team, we executed our plan of action! We were then able to fulfill all customer orders on time, so the challenge ended up as a success story. What is your most remarkable achievement at Amazon so far? I am currently redesigning the layout of one of the areas of my Fulfillment Center: the transshipment area. I’m proud to be carrying out this initiative with valuable input from Amazon Associates. My goal is to further improve the safety of the area, the quality of the processes and employee performance, with the view of achieving concrete benefits for my Fulfillment Center, and other Fulfillment Centers around Europe, further down the line. If you could go back to your first day with Amazon, what advice would you give to yourself to be successful in the Pathways programme? Start small. During the first week you attend the Associate Experience Week and work as an Amazon Associate on the main processes. This time is really precious and unique to Amazon, so take the time to learn and be curious about the tasks performed. Don’t be overly eager about moving immediately on to more senior management tasks; they will come soon enough. Instead, be aware that the time spent as an Associate will really help you to become a better manager in the future. To learn more about the Pahtways programme click here.